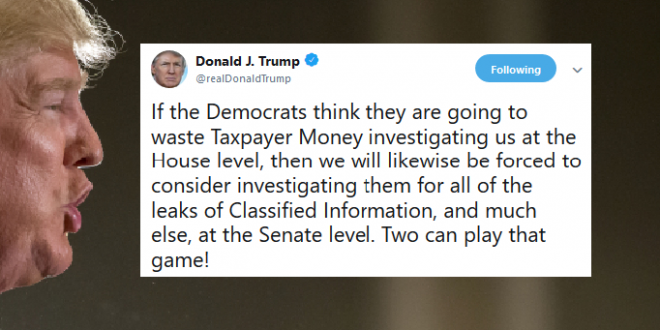 Trump Threatens Democrats As Investigations Loom - Joe.My.God. President Donald Trump will soon be on the receiving end of something he didn’t see much from a Republican-led Congress: orders, backed up by subpoenas, for officials to answer questions on controversial policies like the dispatch of thousands of troops to the U.S.-Mexico border. “Two can play that game!” Trump wrote Wednesday on Twitter. That will subject Trump’s decision-making — as well as his personal finances and potential conflicts of interest — to deeper public and private examination by key committees, as the national focus shifts to the 2020 presidential election.